It’s springtime in Kansas and the time for fantastic storms—unless of course you are a young child terrified of thunder. Just this week we had a storm in the night with a thunderclap so loud it woke our entire household and brought our young Children to tears. So fitting that our lesson this week was the story of Jesus calms the storm. I often set out learning provocations to attract interest in an activity rather than explaining what we are going to do in detail. 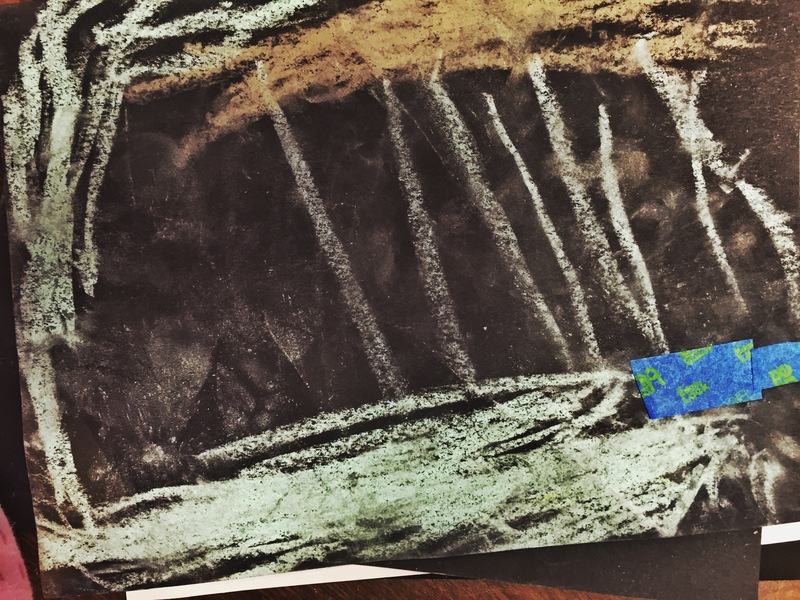 For this provocation, I set out plain sheets of black paper and chalk only in the colors that may be seen in a storm. I gave a very simple instruction to the first few children to arrive, explaining that we were drawing a storm. The children explained what we were doing to the other children as they arrived. This technique is sometimes called strewing in early childhood circles. Learn a little more about strewing here or here. 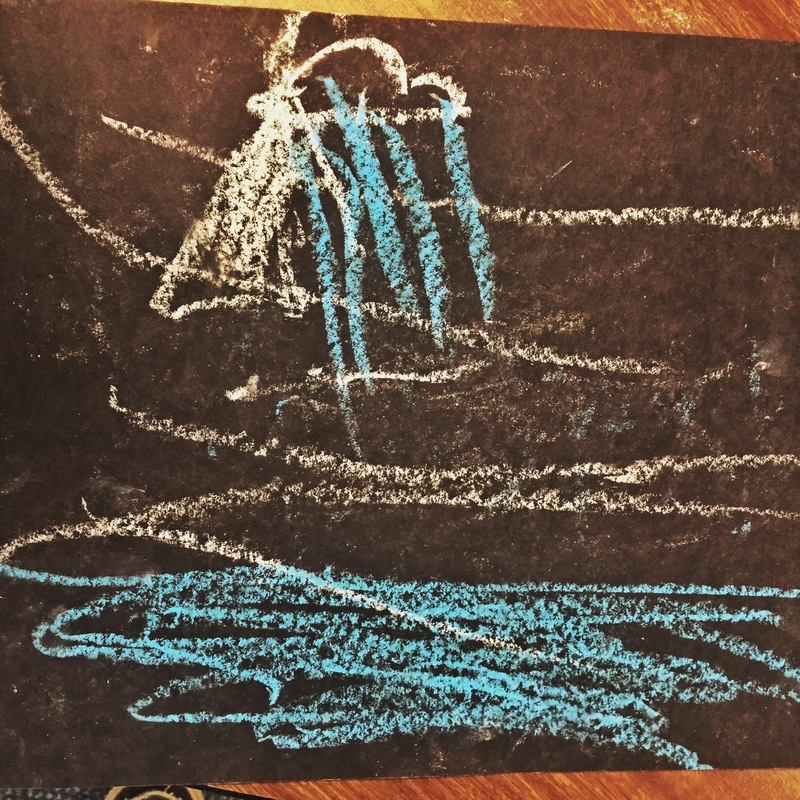 Sometimes the children are immediately interested in what I have set out, sometimes they do something totally different with the materials I set out and sometimes they do something else first and I think….well that flopped. But usually they circle back and become interested later in the lesson time. 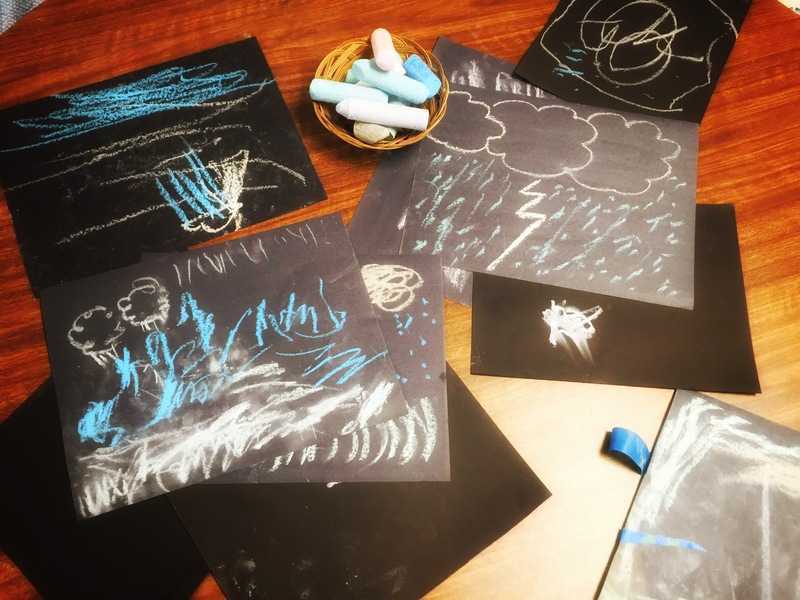 This time the activity connected so well with their real life experience that they dove right in and drew themselves a storm. Woo-hoo! Sometimes I even get to do what they are doing. My storm drawing is up there in the picture above! I know…amazing skills, right?! Here are some samples of their work. 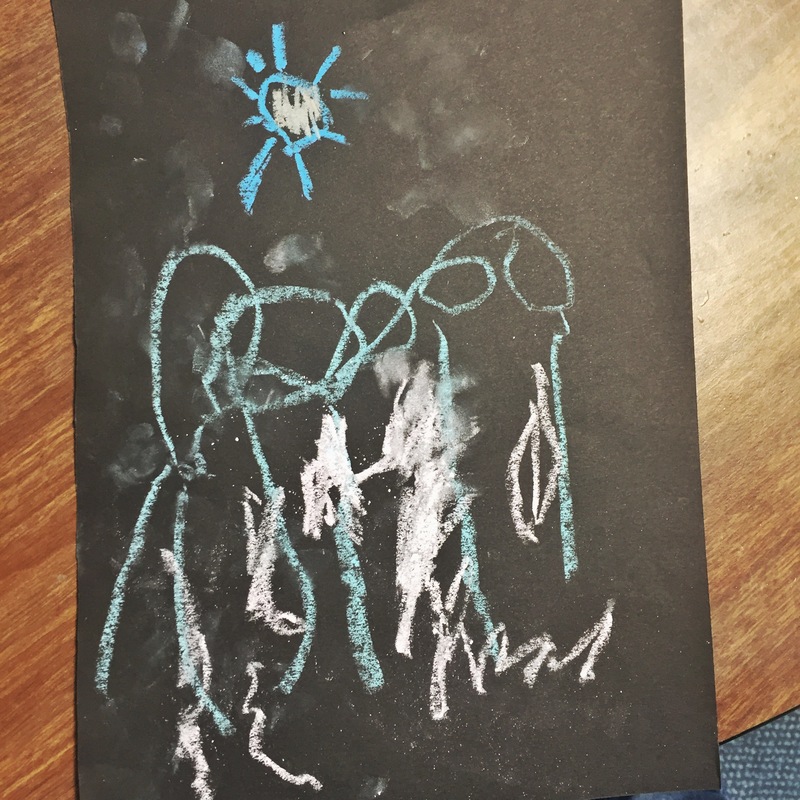 I love preschool art! See how wild the storm is getting? 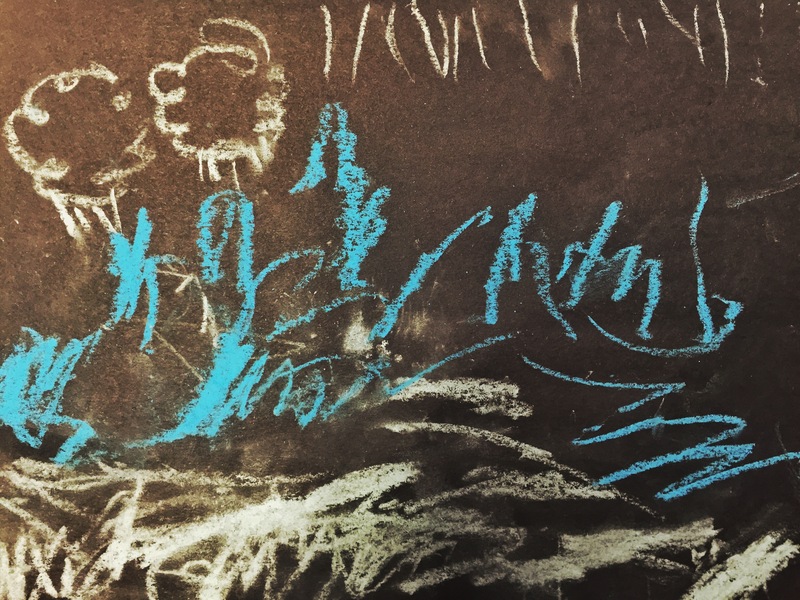 There was a lot of emphatic scribbling as the children drew the intensity of the storm and made it “rain” on their papers. 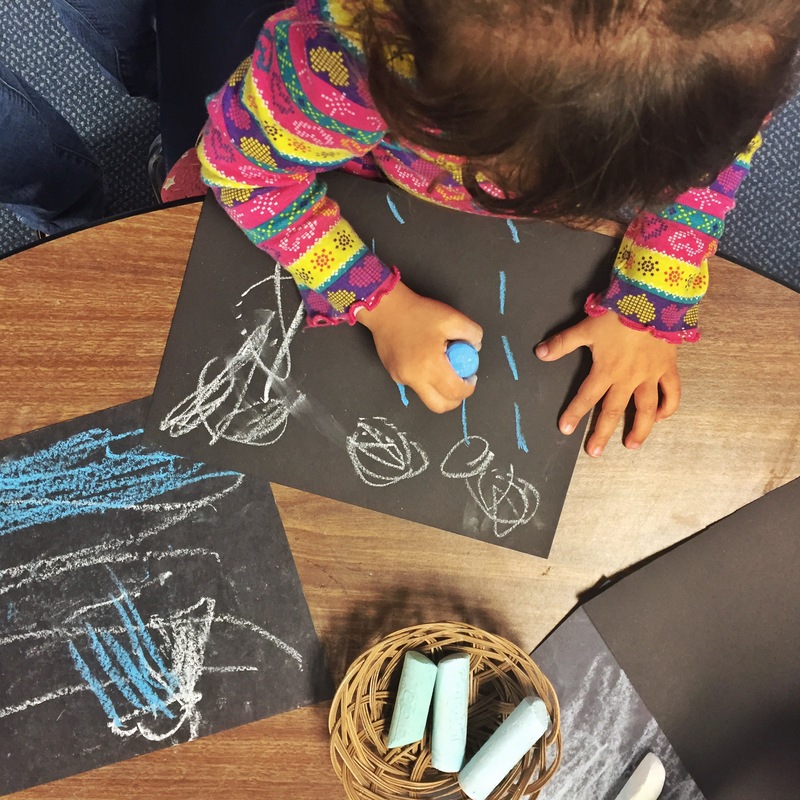 It was evident that the children immediately connected with the invitation to draw a storm. As they drew they talked about storms and make sound effects. LOTS of sound effects! For the lesson time, I pulled out that great Sunday school song of yesteryear…with Jesus in the boat I can smile the storm, smile at the storm, smile at the storm…. did you start singing yet? I actually didn’t learn this one as a kid but it is easy to learn and it gets in your head…so if you need the words, I found them here. I told the story using some simple props. The Fish and fire are for another story, but I did use the wooden figures and boat to tell the story. 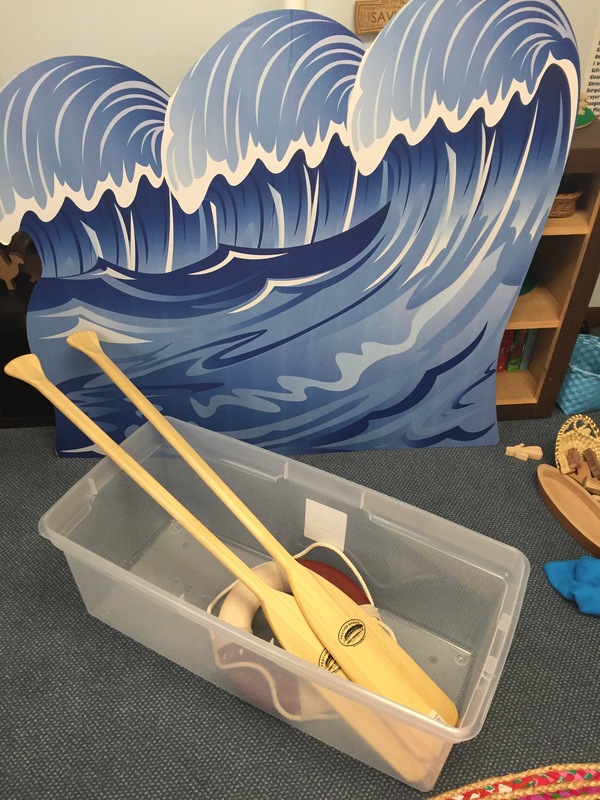 We have wooden props from Worship Woodworks, but any wooden boat would do and you could use wooden peg people for Jesus and the disciples. I love the message of this story and Jesus’ interaction with the disciples. Can’t you just feel the disciples frustration with Jesus that he is SLEEPING when they think they are about to die! And Jesus simply commands the wind and the waves to BE STILL and wonder of wonders they do. In awe, the disciples proclaim, “who is this? that even the wind and the waves obey him!” Jesus gets right to the heart of the matter and asks them about their faith, “Do you still not have faith?” is His question. I imagine that He was gentle, not irritated–reassuring and protective. Like a parent who calms their child during a thunder-storm knowing that even through the sounds are terrifying to the child, they really aren’t in any danger. We fear when we do not trust. What a powerful message for children and a call for those who care for them to protect that sacred trust so that children know they have a safe place and a God they can go to with their fears. We had fun with they story by acting out the storm. I provided the children with noisemakers to create the sounds of the storm. We used Egg shakers and Rhythm Sand blocks and kid sized Cymbals for the thunder. We also used Blue ribbons for the wind and blue scarves for waves. We did this several times so everyone got a turn with the different instruments and props. Each time we practiced Jesus saying, “Peace, be still,” as a cue for the children to quiet the storm. We also put out some props so the children could act out being on the sea during a storm. They took turns climbing in the plastic tote and pretending they were in a storm. We’ve been getting a lot of mileage out of these water beads too. Lots of lessons on water and fish and now a storm on the sea. 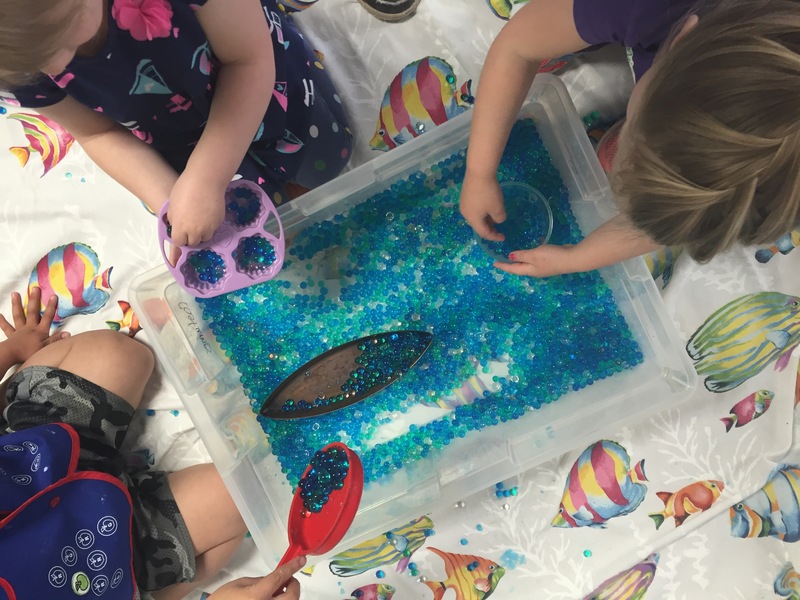 We added a boat to the water beads this week. For more ideas on teaching on Jesus Calms the storm, check out my Pinterest board here. How do you set up learning activities for preschool children? What are you doing that invites children to explore the stories of the Bible through play?